Stacking rings or stackable rings are a jewel made up of different rings in order to make an original and personalized rings set. 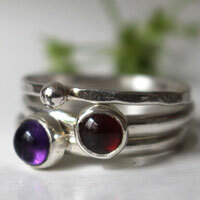 To make a stacking ring set, the rings must be quite thin allowing cumulating several of them on the same finger. You can therefore stack or pile different colors, textures or patterns on the same finger. According to the finger that you will choose to wear the rings, you can imagine a stackable ring set, even for your thumb. On this page, you will find a large choice of rings that can be used in the making of your personalized custom set.